Coming soon we have two brand new Dovecraft Back to Basics collections - and you might just want to make some room in your craft stash for these beauties! Our Back to Basics collections are great for beginners and seasoned crafters alike; as each range is made up of a selection of coordinating embellishments, it’s really easy to make something wonderful! We’ve got mini pegs, washi tape, twine, mini envelopes, and much more, alongside a selection of wonderful craft papers in the usual sizes: 12” x 12”, 8” x 8” and 6” x 6”. Whether you use all of these wonderful crafting accessories together, on their own, or for a range of projects, these crafting essentials are sure to go far! 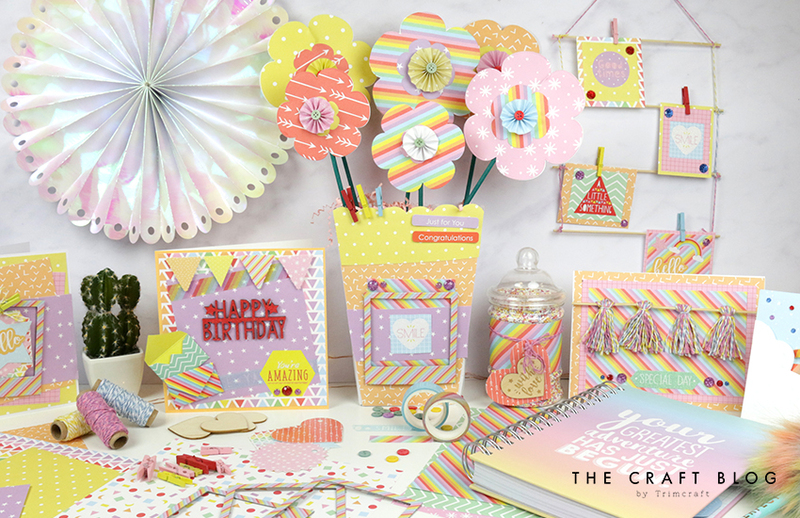 Brighten up your papercrafts with Dovecraft’s Back to Basics Over the Rainbow papercraft collection. With a name like Over the Rainbow, you’d expect a variety of vibrant colours – and that’s exactly what this collection has! These fun pages are decorated with bold patterns and bright pops of colour, making them perfect for so many occasions. Including everything you need to make wonderful, handcrafted projects, this eye-catching collection also features washi tape, sentiment toppers, accordion stickers, mini sentiments and more, to help you make amazing crafts all year round. The washi tape is also perfect for stationery lovers – why not add the two fun designs to your planner or journal? These little frames are also a highlight from this collection – just look at those cool stripes! These decorative frames are perfect for highlighting your precious memories in your scrapbook, or will add a fun finish to handmade cards. Oh hello – the glitter alphabet stickers from this collection are so fun! Just think of all the cute messages you could write with these (and they’re perfect for personalising makes too). There’s so much more in this collection and we’ll keep posting lots about it across our social media accounts, so make sure you’re following us to see more! What do you think to Over the Rainbow? Of course, we couldn’t have just one new Back to Basics collection! We also have the wonderful Pretty Petals for you, which will be a dream addition to any craft box. Illustrated with delicate florals and fluttering butterflies, again this collection will be perfect for so many occasions. As well as stunning craft papers, this versatile collection also includes paper flowers, wooden buttons, ribbons, sentiment toppers, and much more. With this selection of coordinating elements, it’s so easy to create wonderful projects in no time at all! Ribbon is so versatile – use it to create bows, borders, or for gift wrap! These five Pretty Petals designs will come in so handy for so many projects. Printed tags aren’t just for gifts – use these beautiful designs as an eye-catching focal point on a handmade card! Coloured twine is so useful too – use this selection for adding to cards, finishing handmade tags and more! Can you spot any more Pretty Petals embellishments on this card? It’s made entirely with this collection! What do you think to these collections? Keep your eyes peeled for these in stores across the next few weeks! We’ll also be posting more images of this collection across our social media accounts, so make sure you’re following us on Instagram, Twitter and Facebook for more. Which is your favourite collection? Let us know in the comments section below! Which is my favorite??? That answer is nowhere to be found, as I just lLOVE them both, and not sure I can decide which of them the most? I love the colors and lovely patterns on both too, so it´s really impossible to answer. Can´t wait til they hit the stores and hopefully nit wount take as long this time as it normally does overhere.